A large and extremely dangerous tornado is hitting Coushatta, Lousiana right now, which is east of I-49 and southeast of Shreveport. 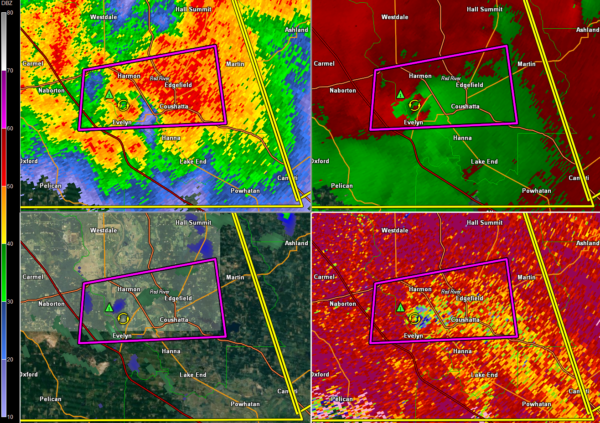 There is a PDS or Particularly Dangerous Situation tornado warning in effect for DeSoto and Red River parishes. near Coushatta, or 16 miles east of Mansfield, moving east at 25 mph. Coushatta, Edgefield, Grand Bayou and Armistead. closest substantial shelter and protect yourself from flying debris. immediate tornado precautions. this is an emergency situation.